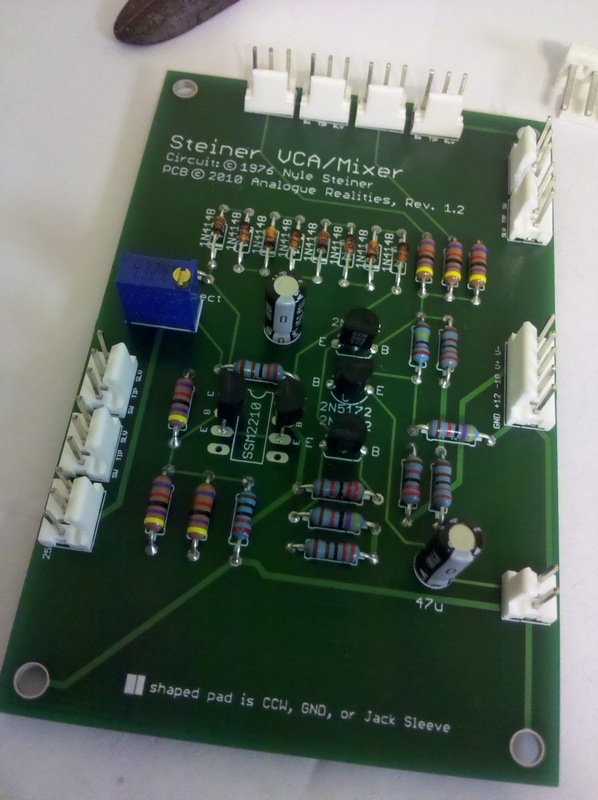 The Synthasystem VCA doubles as a mixer with its 3 inputs, which is a nice feature. It is a relatively easy build. This is one of the modules that uses the external power regulation PCB: it connects to the board via the 5-pin MTA-100 header on the right. The two sets of input summing resistors are all 0.1% tolerance. The BOM calls for the CV Reject trimmer to be 250k, but I've used a 200k as there's no 250k with this footprint. It should work fine, and David's Synthasystem pages mention this. The final thing to note is that I've used a pair of discrete BC500B transistors, rather than a SSM2210 chip. The pads are labeled to allow for discrete transistors; just be sure to check the datasheet to position them correctly. Originally I planned to use the SSM2210s, but at $10 each (and given the number in the system), it didn't seem too practical. Plus, apparently they aren't really crucial either; in some later Synthasystems, even the transistors in the VCOs weren't matched. I will still use a THAT340 chip in the VCO exponential converter (which is temperature controlled too), but I think that's the only place I'll use a matched pair.